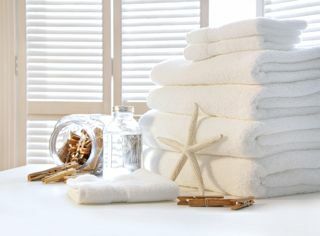 Laundry Products — Aqua Systems, Inc.
A special blend of surfactants and optical brighteners give superior results when used on cotton or synthetic linen. This incredibly powerful detergent is formulated to be tough on stains and easy to rinse, preventing residual buildup. A heavy-duty alkaline builder with soil suspending agents that provides the power to release even the toughest soils. It can be used with any of our fine detergents. An effective liquid chlorine bleach which provides effective stain removal. This EPA registered product prevents odor buildup and also sanitizes the linens. This product promotes whiter results and is especially effective on cottons. It is also safe to use on synthetic linens. A concentrated liquid laundry sour that neutralizes PH levels in the wash as well as controlling stains in rusty water. It is especially effective when used with Aqua Laundry Softener. 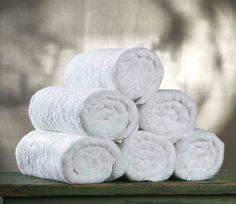 A scented softener that returns linens to the desired softness for your guests. This product reduces static in the wash as well. A carefully formulated sour/softener that effectively balances the PH of the wash while it softens and freshens textiles. A built in bacteria stat keeps the linen fresh as it rests in storage. This product is scented for a final result that is beyond your expectations. A bacteria / enzyme culture and Big D Deodorant. Digests organic wastes, reduces volume of solids and kills odor. Contains minimum of 4.73 billion aerobic and facultative anaerobic high enzyme producing bacteria which will multiply when used as directed to digests wastes. A powerful cleaner that removes all rust and stains on contact, like magic. A special blend of surfactants, optical brighteners, and natural cleaners from citrus peels. Gentle on all fabrics and primarily used in all top-loading washers. Spotter containing solvents which emulsifies oils very efficiently. Products must be placed in the washer immediately after saturating stain. Best used on make-up, ink, suntan lotion, rubbing oils, spa lotions and creams. Our toughest pre-spotting agent containing enzymes that perform best on troublesome stains such as blood, bodily fluids, food stains, gum, dirt, grease, wax, and dyes on most surfaces by chemical reaction.